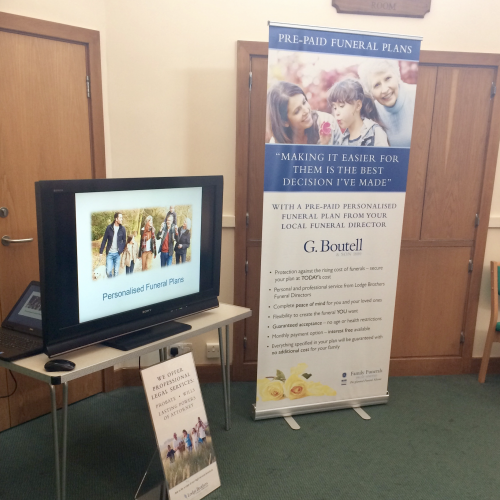 Paul Bye Dip FD Surrey Commercial & Operations Manager for Lodge Brothers has been hosting a series of talks in Surrey on the benefits of Funeral Planning and Will Preparation, the seminar is free to attend and is an ideal opportunity for you to gather information and ask questions relating to planning your funeral in advance. These sessions are proving to be popular, so should you be interested in attending, we would recommend booking your place on the next seminar which is to be held on Tuesday 10th July at 11am at the Cobham Village Hall, Lushington Drive, Cobham KT11 2LU. Call 01932 450360 to reserve your place. The event should last only an hour and will also be attended by Sophie Andrews from Lodge Brothers Legal Services.